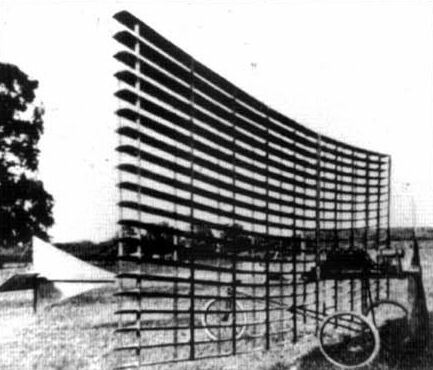 Although this Phillips Multiplane of 1904 was the third of the heavier-than-air designs by the English scientist, Horatio F. Phillips, it was also the first of his machines aimed at free flight. Sadly, the wing structure proved inadequate for the lift produced and the whole array folded upwards on its first attempt to fly. The two designs Phillips had produced previously were actually more successful than the 1904 Multiplane, both having 'lifted-off' successfully during the 1893-1894 period. These earlier machines were never intended for free flight, being more in the nature of aerodynamic lift demonstrators, operating off a circular track around a centre post from which they were tethered. In the course of these experiments, the second of these lift demonstrators briefly carried an all-up-weight of 385lb aloft. A scientist, rather than an engineer, Horatio Phillips (b. 1845) made such a significant contribution to the understanding of airfoil, or wing section shaping, that many consider him the true father of modern aerodynamics.